An eye-opening examination of the stupid things smart people do—and how to cultivate skills to protect ourselves from error. Smart people are not only just as prone to making mistakes as everyone else, they may be even more susceptible to them. This is the "intelligence trap," the subject of David Robson’s fascinating and provocative book. 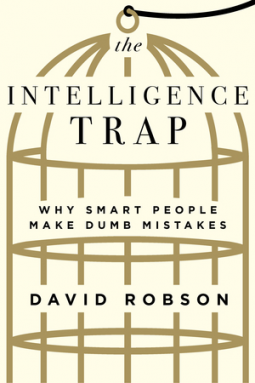 The Intelligence Trap explores cutting-edge ideas in our understanding of intelligence and expertise, including "strategic ignorance," "meta-forgetfulness," and "functional stupidity." Robson reveals the surprising ways that even the brightest minds and most talented organizations can go wrong—from some of Thomas Edison’s worst ideas to failures at NASA, Nokia, and the FBI. And he offers practical advice to avoid mistakes based on the timeless lessons of Benjamin Franklin, Richard Feynman, and Daniel Kahneman. About the Author: David Robson has worked as an editor at New Scientist and BBC Future, and his writing has appeared in the Atlantic, the Observer, and the Washington Post.